My homemade venison cheeseburger soup is so delicious, easy to make and a guaranteed belly warmer. This is comfort food at it's best. Serve with fresh bread and a salad for the ultimate meal. If you want to add 1 lb of ground beef with the venison burger - you may do it. It works perfectly; just drain the ground beef after browning it. In a large saucepan, put the potatoes and enough water to cover them by about 2 inches. Bring to a boil over high heat. Lower the heat to medium and simmer, uncovered, until fork-tender, about 15 minutes. Drain and return to the pan. Cover and keep warm. In a large stockpot, heat the oil over medium-high heat. When hot, add the venison burger and cook, breaking up the meat slightly with a wooden spoon, until the burger begins to brown, 6 to 10 minutes. Add the onion and the bell peppers and cook, stirring, for another minute or two. Add the jalapenos and then the flour, herb blend, salt, and black pepper. Cook, stirring, until well mixed and thickened, 3 to 4 minutes. Add the broth, lower the heat to medium, and cook, stirring, until heated through, taking care not to break the meat up too much. 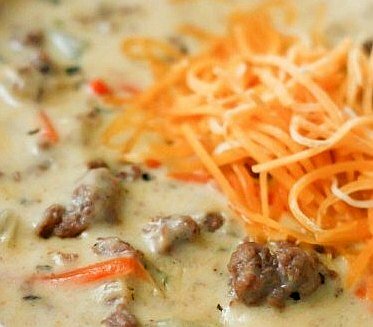 Remove the pan from the heat, add the slices of cheese, one at a time, and stir gently until the cheese melts into the soup and the soup becomes creamy. Add the scallions and the potatoes and cook just until heated through. Serve hot. **You may also use 1 lb of ground venison and 1 lb of ground beef if you wish. The best thing to make that goes hand in hand with this is garlic bread (or cheese bread). Enjoy.